It all began with Hasbro back in 1964. US toy giant Hasbro created a line of 12″ military GI Joe action figures based on the soldiers, sailors, pilots and marines of the US Armed Forces. Then in 1966, licensed by Hasbro, Palitoy released their own British version of GI Joe – Action Man. The very first figures in the Action Man range were the WWII-inspired Action Soldier, Action Sailor and Action Pilot. 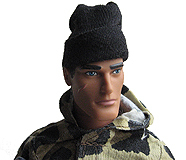 Throughout the seventies Action Man was an enormously popular toy which Palitoy recreated in numerous adventure and sports as well as military versions. He was given a range of accessories and vehicles and along the way acquired flock hair, moveable eyes and gripping hands. Some versions could even talk! Palitoy closed its doors for the last time in 1984 but in the 90’s military style Action Man figures based on the American GI Joe range were once again available in the UK this time thanks to Hasbro itself. From the mid-90’s onwards new Action Man figures were still released though in generic ‘adventure’ outfits with no direct military connection. All of which leads to 2009 and the launch of British company Character Option’s new line of military-inspired action figures and toys HM Armed Forces. In close consultation with the Ministry of Defence UK design company Designworks and Character have sought to once again recreate a line of action figures which take direct inspiration from serving military personnel. One obvious distinction between prior lines of military figures and HMAF is their scale. Whereas Action Man came in the time-served 12″ version, HMAF action figures are in an all new 10″ scale format. In terms of accuracy, authenticity and attention to detail, qualities for which the early 1960’s Action Man figures are well known, HMAF action figures score very highly. Its great to see the return of the metal dog tags. But its not just in the uniforms that the attention to detail can be seen. In the range of accessories and vehicles accompanying the HMAF figures an incredible dedication to detail and authenticity is strikingly apparent. HMAF figures are indeed a worthy successor to GI Joe and Action Man military action figures. Character – We salute you!